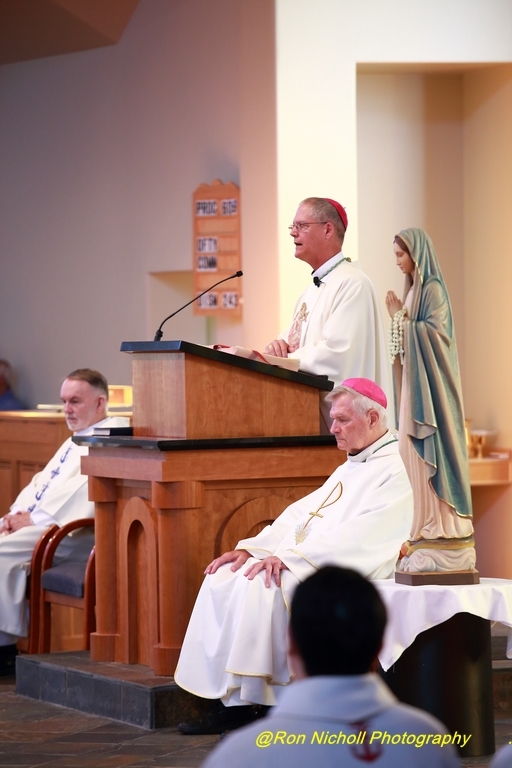 The Archdiocese of Anchorage dedicated Wednesday, the Feast of the Queenship of Mary as a Day of Prayer for Healing. The Co-Cathedral was nearly full for the 9:00 am Mass. 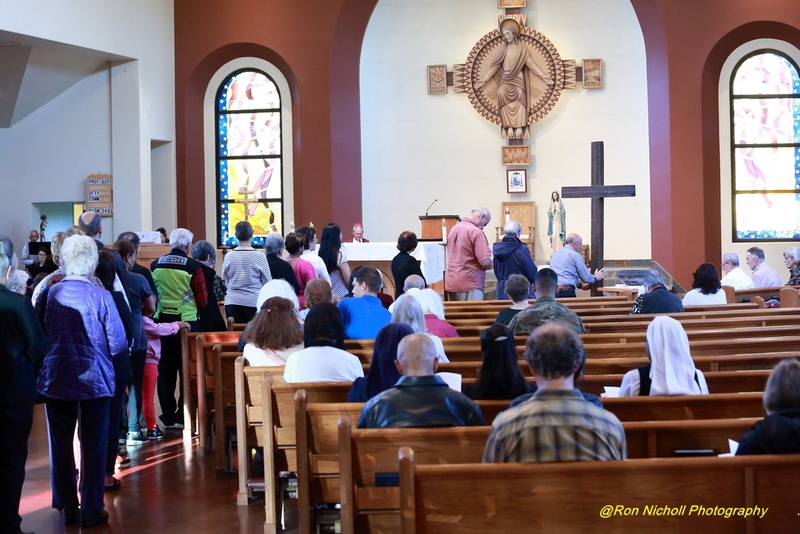 Many people visited throughout the day to pray before the Blessed Sacrament, and the church began to fill again around 4:30 for the 7:00 Prayer Service. The church was perhaps three fourths full for the prayer service. 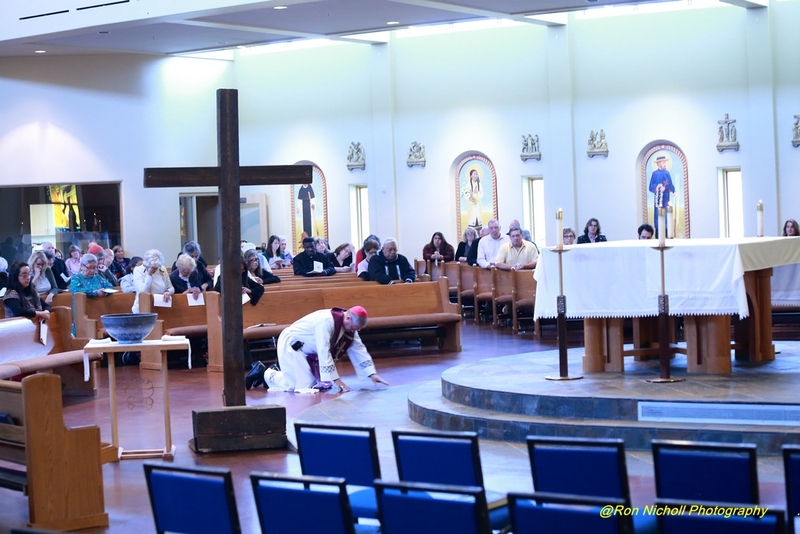 I am grateful for the many people who came to join us in prayer, and for all those around the Archdiocese participated in the prayer services at their local parish. For all the others who joined us in a prayerful spirit, wherever you are, thank you. 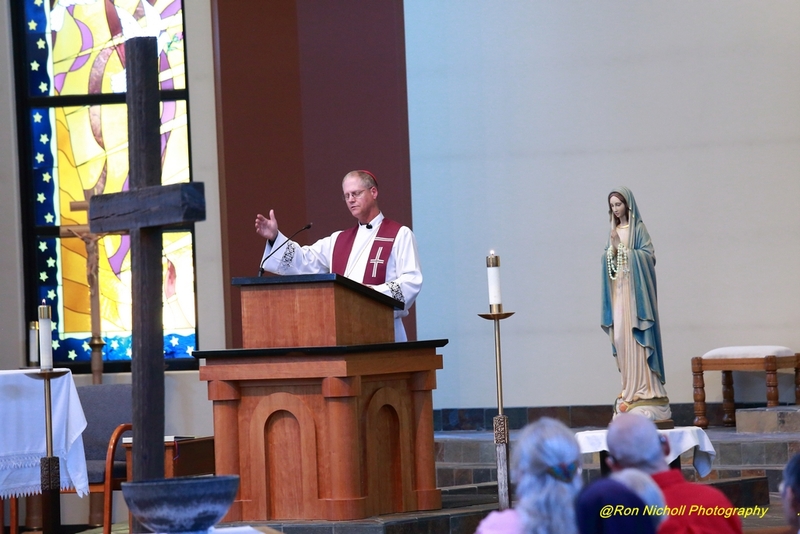 My homily can be found below, along with a few pictures. Good evening. Thank you for being here. I’ve been here all day, since around 8:00, and it has been quite edifying and comforting to see such a large crowd for Mass and the many people who came throughout the day to pray, to visit, and to be with us here tonight. It is clear the Church is in good hands with all of you and your profound faith! We come together tonight to pray for healing for those who have been sexually abused. We come together to pray that Jesus may heal all the wounds of his Body, the Church. In tonight’s Gospel selection (Matthew 18:6-7) Jesus makes it clear; “there is no room in Church ministry for those who would harm children, betraying their trust and destroying their innocence.” (A Rosary For Healing And Protection – USCCB). 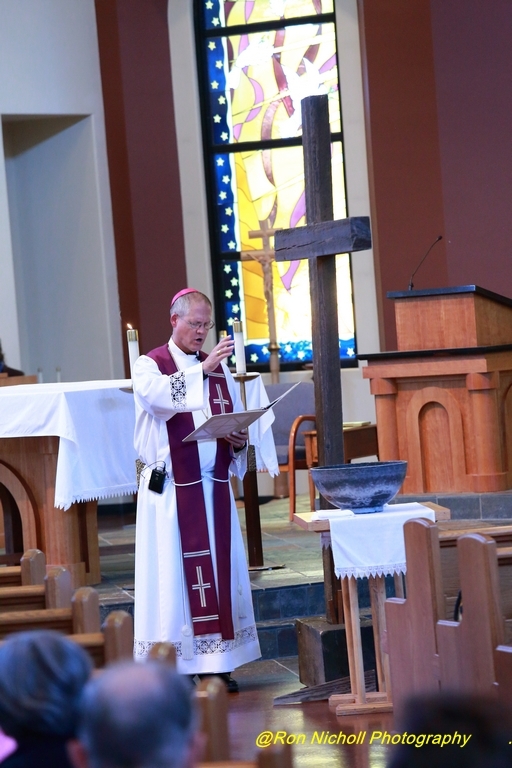 As a Bishop, as a Pastor, I express my personal apology to those who were abused as children by a Bishop or Priest, or anyone who represents the Church. I apologize for those in Church leadership, especially Bishops, who refused to hear your story, that they were more concerned about the reputation of the Church than your well-being. I apologize to your families and loved ones who have watched your suffering and for the pain they too have experienced. I apologize to the members of the Church who are scandalized by these failures of our shepherds. I apologize to those who have tried to get the attention of the Bishops saying ‘more needs to be done’ – for failing to heed your pleas. I apologize to the priests and deacons who have been faithful and blameless in their service of God’s people, for the pain and shame cast upon you by the sins of our brothers. 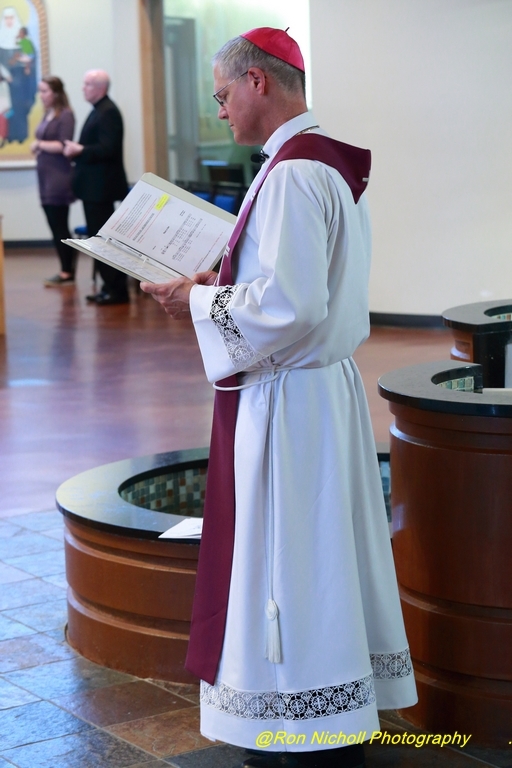 I apologize for the times I have failed as a Priest and a Bishop to grow in holiness; to become a better Good Shepherd. We pray tonight, through the intercession of Our Blessed Mother for healing. We come to the Lord tonight – we come to be healed. In another account from Luke (5:17-26) Jesus is surrounded by a large crowd while he teaches. The scriptures say: ‘and the power of the Lord was with him for healing.’ And some men brought on a stretcher a man who was paralyzed. They simply wished to play him in the presence of Jesus. Due to the crowd – they lowered the stretcher through the roof! and placed him in front of Jesus. And Jesus healed the man. My friends, note well, not just the power of Jesus to heal and forgive, BUT, the FAITH – the importance of FAITH in JESUS – for Him to heal. Recall in another account (Matthew 13:58) where Jesus did not perform many miracles because of the lack of faith among the people. These Gospel accounts remind us that Jesus is in our midst. He continues to journey with us. Fundamentally, the Church is One in Jesus Christ. We come together tonight as a Community of faith. We recognize that we face this present crisis together. The people of God need good, holy Shepherds, and the Shepherds need you – the people. We are in this together. St. Paul teaches that “our Blessing Cup is a Communion in the Blood of Christ.” Christ is our unity, our peace, our healing. I’m not sure where we go from here other than the Cross of Christ, who will eventually shed his grace and light upon us. For now, we need his healing and the wisdom that comes from sitting silently at his feet, from the Holy Spirit he sends, from the grace and mercy of God the Father. With Mary, we come to the foot of the cross to gaze upon Jesus who was crucified for our sins. Mary knew great grief and burden throughout the passion of her Son. We too are sharing in a similar way with our own grief and burdens. We now live them at the foot of the cross. But, we do so in the hope of the Resurrection that will surely come to this moment of darkness and difficulty.